Ingredients: Turkey, water, salt, flavorings, monosodium glutamate, sugar, sodium nitrite. Sprayed with potassium sorbate. A very faint saltiness first hits the tongue, followed by touches of natural turkey meat flavor. The chewing brings in a little more saltiness, along with some black pepper. The natural turkey meat flavors has little more definition. I can also detect touches of garlic. 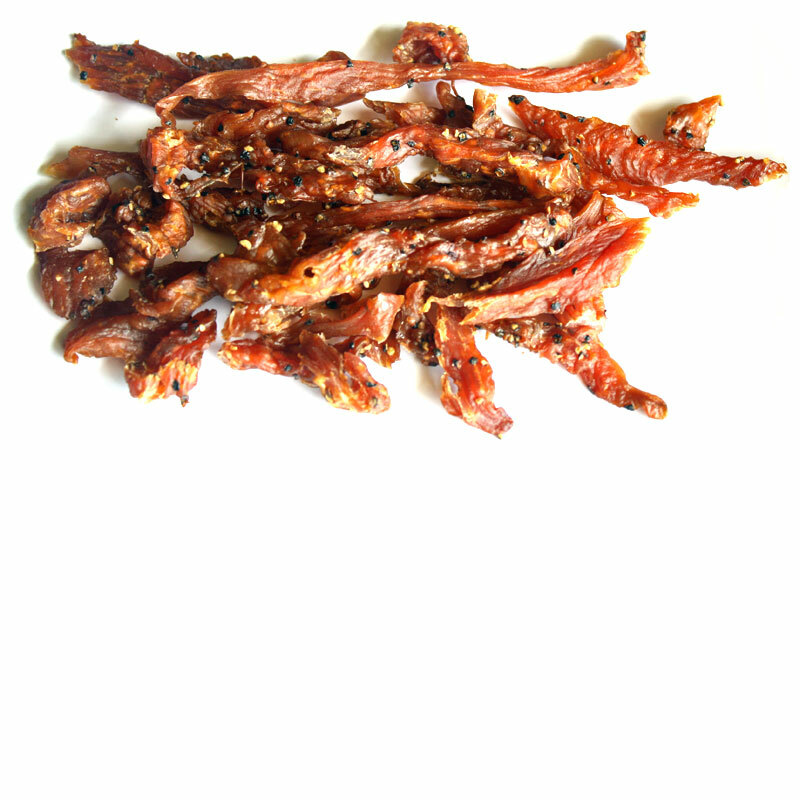 Compared to the company's Original beef jerky, this turkey jerky is much like the same, except it tastes like turkey. It's mostly a saltiness with black pepper that I taste, and the black pepper can be quite spicy. It's not mild by any means, and folks who can't tolerate spicy foods will find this overwhelming. I also pick up what tastes like bursts of garlic here and there. The meat consistency looks to be very lean. 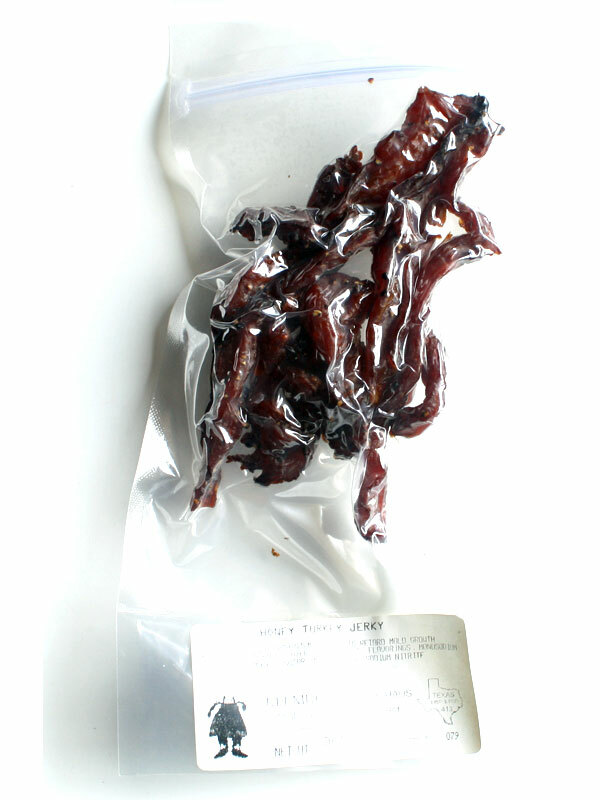 This jerky is very dry, and quite chewy. Some of it is tough. Once it's chewed down, it feels crumbly, and not at all like turkey meat. Just a wee bit of saltiness is the only thing that hits the tongue when I put a piece into my mouth. But as soon the chewing commences, I get more salt, some black pepper, a faint bit of sweet, and some light natural turkey meat flavor. Considering this jerky is labeled, "Honey Turkey Jerky", it doesn't really taste like honey. I don't really taste much sweetness at all, aside from a faint bit. I don't taste any of the maple sugar, either. It is, however, a touch more sweet than the company's Original turkey jerky, but not really enough to warrant the description, "Honey" in my opinion. The meat consistency feels less dry than the Original turkey jerky, feeling just a bit more moist. Overall, it's still a dry jerky, however. The chewing feels more meaty, less crumbly, than the Original. 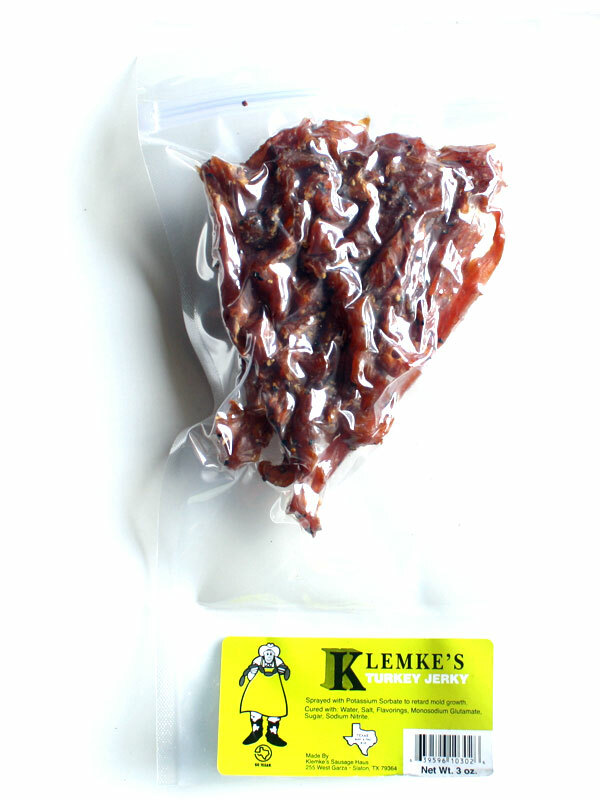 Verdict: These two turkey jerky varieties offered by Klemke's Sausage Haus seem to generate a satisfying amount of snackability through an old fashioned flavor that relies on salt and black pepper. The Original seems to throw in some garlic, whereas the Honey seems to throw in a touch more sweet. The Original felt rather dry, and had a crumbly chewing, not feeling any like chewing turkey. The Honey, on the other hand, had more of a turkey meat chewing, but didn't taste at all like honey, and was only lightly sweet at best. The two seemed to be snackable enough, but otherwise don't seem to go above and beyond.